Our experts will help you find the perfect castors. We offer the service to make bespoke wheels to our customers own specifications, also to rebond existing wheels. Unbeatable prices on Jacking Castors. Contact us today with your requirements. A selection of wheels to suit a wide variety of needs from a light duty rubber to a heavy duty polyurethane tyred wheel. We stock a large range of Industrial Castors, Institutional Castors, Medical Castors. Our castors and wheels go into many industries including Manufacturing & Fabrication, Construction, Wholesale, Food & Beverage, Hospital & Medical Equipment and Building Installations. Our ranges include light duty castors, medium duty castors, heavy duty castors, extra heavy duty castors, specialist castors, jacking castors and wheels. We have castors with a plate fixing or a bolt hole fixing. Castors are available with swivel castors, braked castors and fixed castors so you can choose which wheel type is needed from rubber castors, nylon casters, polyurethane castors, pneumatic casters to cast iron castors. There are many options to choose from for all types of needs. Where 4 castors are being fitted, times the castor load by 3 to give you a total capacity on an evenly distrubited load. We have been supplying a standard range and bespoke range of trolleys to industry and retail outlets for over 70 years including the NHS and many blue chip companies, as well as small and large retailers. Please Note load capacities are based on evenly distributed loads. At Reids Trolleys we have our own range of shopping trolleys. There are different trolleys for different uses. We offer both a shallow (70ltr) and standard (150ltr) shopping trolley each with an optional £1 security lock. All shopping trolleys can be branded with customer colours and logos on the handles. We also offer a range of shopping baskets, stock carts and shelf stackers, pallet trucks and rollcages. 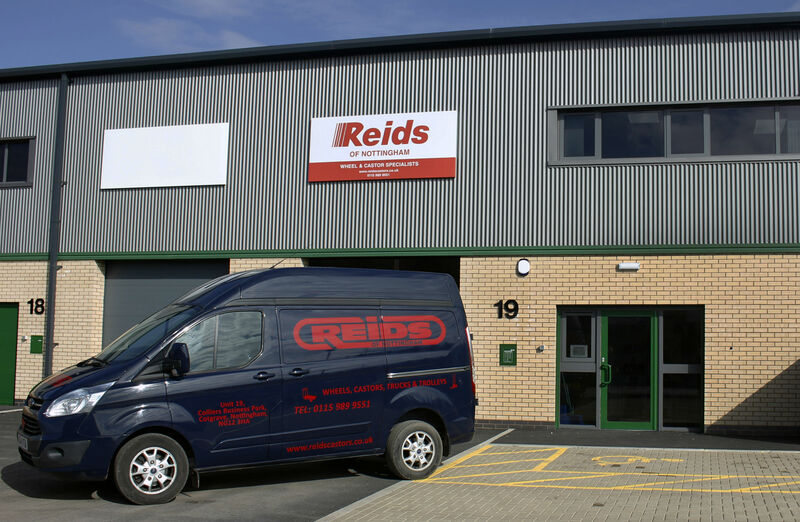 Reids can offer a next day delivery service for local and nationwide deliveries.